The Jonmeri 40 is a yacht with a rich classic look, nice lines, well balanced design with nice accommodations below decks, built with love and care that meets the highest quality even to Scandinavian standards. The Jonmeri 40 is also a excellent offshore cruising yacht. 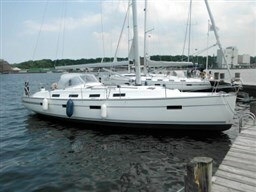 She has good stowage space and is a safe and stable yacht for cruising with family and friends. Walking her decks and looking at the details, make you realize this yacht is very well built. Dear Sirs, I have seen on YachtVillage your offer about Jonmeri Yachts Jonmeri 40 - 1992 (code: 269559). I am interested in the offer and would like you to contact me. Thank you.